Lords of Blood: Half way to completing the Cruor! Half way to completing the Cruor! Dzamhes the Decapitator has merged with his weapons to such an extent that it is hard to tell where he ends and they begin. He wields his brutal sword and whip with expert skill, leaving a trail of dead behind him as he chases the next hero whose tale he will end. Gotfrith the Deflagrated faced one of the founders of the Grey Knights during the Horus Heresy, who cast him back into the warp using sorcerous flames that stripped the flesh from his bones. Despite being rebuilt in brass and iron he has never fully recovered, and his wings remain in tatters. He has nurtured his hatred over the millennia, and now his loathing of all living things is a potent force that fills all in his vicinity. I love the Morghast wings, and as soon as GW released them I wanted to use them to make Skarbrand. Very happy with how it worked out. Vizekh Sorceror-Bane has always been a foe of those who delve too deep into occult lore. He lurks in the warp, waiting for a psyker to get too greedy, to attempt to use a spell beyond their ability to control, poised to consume their souls. 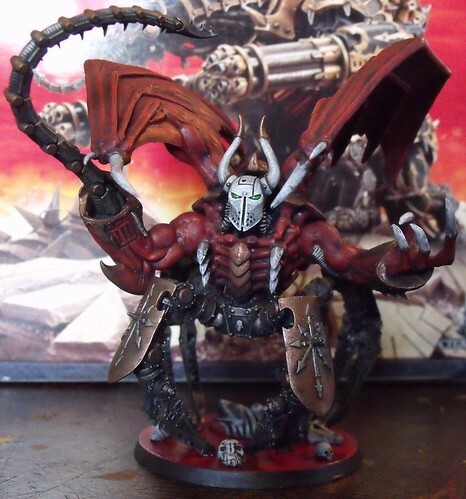 Putokh the Disemboweler has spent the aeons of waiting in the Warp well, crafting himself a fearsome body in Khorne's Brass Foundries. Now when he emerges into realspace he soars high above the battlefield, before diving into combat feet-first, chain-claws revving, and tears his apart enemies before they have a chance to defend themselves. Next up I want to make some Chaos Space Marines to round out my Daemonkin, the Skull Takers of Hans Kho'ren.